TSN Toronto reporter Mark Masters checks in daily with news and notes on the Maple Leafs. The Maple Leafs skated at Capital One Arena on Saturday morning. Earlier this week, Capitals centre Evgeny Kuznetsov was asked if he wanted to one day win the Hart Trophy. “I don’t give [an expletive] about that," he told a group of reporters, including Isabelle Khurshudyan from the Washington Post. "I want to have fun and I want to make those risky plays when sometimes you don’t have a play and you guys don’t understand every time those plays." It's a sentiment that Auston Matthews certainly appreciated. "Yeah, I read that actually," the Maple Leafs centre said. "I loved it. I think a lot of us sometimes, especially us young guys, stray away from having fun. We’re all still kids. I mean, that’s why we played the game as long as we have and why the NHL was a goal, (it) was because of how much fun we were having on the ice." Matthews has long admired the way Kuznetsov, 26, approaches the game. "He's one of my favourite players to actually watch," Matthews noted. "The stuff that he can do with the puck not a lot of guys can do, and he’s just a fun guy to watch. He’s not afraid to get creative and, in my mind, (he's) very underrated." The 21-year-old Matthews says he's getting more comfortable showing off his personality this season, including doing a couple photoshoots before the regular season began. "At some point you have to do what makes you happy and put yourself out there, have fun and not care what people think," he said. Matthews also enjoyed watching Alexander Ovechkin and the Capitals celebrate a long-awaited championship last spring. “I thought it was great," said the Arizona native, "especially, you look at a guy like Ovie, he’s been a premier player and it probably took him a bit longer than he expected or wanted. You see the excitement and how much fun they had after winning, I think everybody around the league saw that and guys who haven’t accomplished that feat, obviously, want to do that, because it’s the best feeling ever ... I think it just proves how hard it actually is to accomplish. It was good for us to see that." It took 13 seasons for Ovechkin, the first overall pick in 2004, to drink – and do keg stands – from the Stanley Cup. "This is a good message for all people," said Leafs coach Mike Babcock. "It just doesn’t happen because you think it should. Lots of times it takes battle scars. I think (Steve) Yzerman won it when he was 31 or something like that, you know, not that he wasn’t a great player the whole time. Ovechkin, if I’m not mistaken, is 32. Is that right? (Editor's note: Ovechkin is 33.) So, when you go through it, it takes some time usually. You have to go through it and compete and learn how to win and learn how to win when it matters." There were other lessons to draw from the recipe the Capitals used en route to victory. Specifically, Babcock notes Washington relied on incredible centre depth in the form of Nicklas Backstrom, Kuznetsov and Lars Eller. 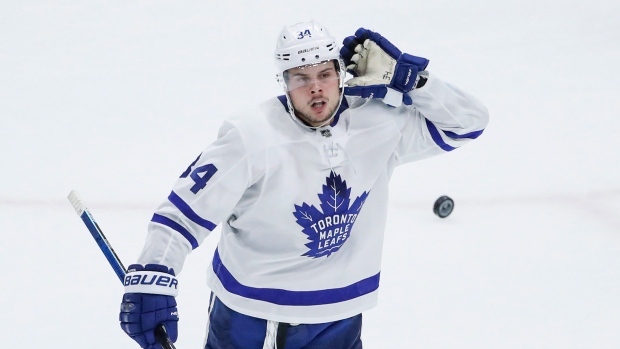 "One of the reasons you win is you’re deeper down the middle than other teams and I thought they were the deepest team that way last year," the Leafs coach said. "I mean, Backstrom, Kuznetsov, Eller, they’re all elite players. I don’t know who the one is and who the two is, but they’re good. I think we’re in a situation that, as we mature into a group, we’re set up like that as well." But scoring depth is also important. Devante Smith-Pelly, for example, produced seven goals in the playoff run while Brett Connolly had six. "That’s what you need from a championship team," said Nazem Kadri when asked for his takeaway from the Washington run. "They had guys up and down the line-up being able to score and contribute at different times. You can’t always rely on your scorers to score all the time. You need those third- and fourth-line guys to be able to contribute and that’s what they did and that’s how they won." Despite an offensive explosion to start the season – 25 goals in five games – almost all of the Toronto offence has come from front-line players. Matthews has nine goals, Tavares has six, Mitch Marner has three and defenceman Morgan Rielly has three. Defensive defenceman Ron Hainsey has managed two, including an empty netter. Connor Brown also has an empty netter while Kasperi Kapanen has chipped in one tally. Patrick Marleau, Kadri and Zach Hyman are among those who have yet to bulge the twine. "To be honest, I feel good out there," said Kadri, who's broken the 30-goal plateau in consecutive seasons. "I feel like I’m making plays and our offence is there. For me, individually, I think it’s going to come. A couple posts, not much you can do. I’d be more frustrated if I wasn’t getting chances. It’s just a matter of time." Perhaps the addition of Andreas Johnsson will help create some depth scoring. After sitting out the last two games as a healthy scratch, the left winger should be motivated to make an impact as he gets back in on Toronto's fourth line alongside Frederik Gauthier and Josh Leivo. Johnsson was the MVP of the AHL playoffs last season producing 24 points in 16 games for the Marlies. "The biggest thing is you got to play good," said Babcock. "He, obviously, had an elite finish (last season), won the Calder Cup, that's all over with. You got to do it at the National Hockey League level. They're different leagues. We think Johnny is a good player and now he's got to become a good player every day in the National Hockey League. And that means with your preparation, that means with your play on the wall, that means with your turnovers, that means with your power play time, everything. It's often a great reminder to all of us, when things don't go as well as it should, it's kind of a reset and he's been given that." Tyler Ennis, who started the season on the Matthews line, will be the odd man out tonight. He has one assist and a minus-three rating this season, but Babcock objected to the notion that the benching is an indictment of the veteran's effort. "You're misreading things," the coach clarified when asked what wasn't working for Ennis. "He didn't come in here to play with Matthews. It's just [William] Nylander wasn't here so he got to play with him. This is exactly what we expected. He played good last game. Johnny's been out for two, Johnny's going in. But this is what we expected so to say that, 'He hasn't done anything,' would be wrong. This is what we expected from him. He's done a good job and he'll be back in ... We're happy with him. He's a good person. He's skated good, he's made plays, he's done his thing and we've been happy with him. It gives us a veteran forward, who's played in the league, who knows how to play. It's not always easy to be in his spot, but he knows the spot he's in, that's what we signed him for. I think it's going really well for him."